Screenshot of the week: I'm not in the mood for a funny, humorous screenshot of the week. 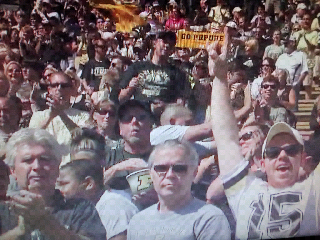 As you may remember, I complained about how Purdue's most important two games of the season were relegated to BTN. While it may have been a blessing in disguise that the nation didn't get to watch the drubbing, BTN made it even more painful to watch for those of us who actually were watching. Check this screenshot out as the ball is being snapped in midair to Denard Robinson. Notice anything missing??? That's right. NO down and distance. NO first down yellow line. 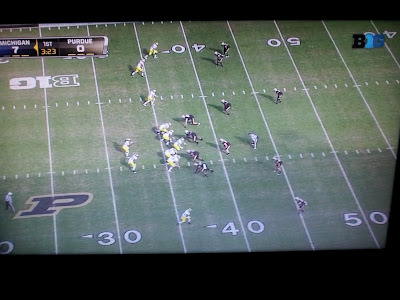 The only reason I knew I wasn't watching a Purdue-Michigan game from the 70's was the scoreboard and the fact it was in HD(ish). In the first half, BTN went nearly every down either not showing the down and distance or showing it as the ball was getting snapped...pretty useless if you ask me. 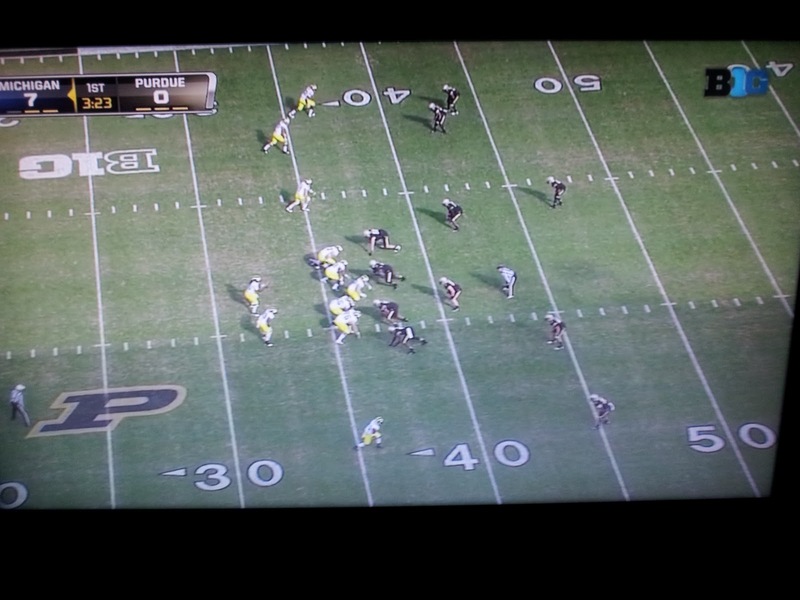 Plus, I'm pretty sure BTN has a quota of 10 first down yellow lines per game. This technology has been out for years - why can't you do this on a regular basis??? I'm not asking for all camera angles to show it, just show us the first down line or at the least zoom out so we can see the marker on the side of the field. If I could watch the game again without throwing up, I'd put up 3 more screenshots where they had the yellow line and line of scrimmage switched. Glad I'm going to the next two games...I can't put up with this crap much longer. Thing I learned from BTN: BTN showed a stat that Michigan is 15-9 vs. Purdue all-time in West Lafayette, but leads the series 43-14. Further research says that, sure enough, Michigan is 24-5 vs. Purdue in Ann Arbor. Both teams joined the Big Ten in 1896 which leads to 2 questions. Why have they played each other only 57 times? And why have they played 5 more games in Ann Arbor? The first question can be further narrowed down to the 20's, 30's, and 50's in which Purdue played Michigan only once in each of those decades, but I have no explanation why. The second question also baffles me. Anyone who can figure out an answer deserves a guest post...let us know in the comments. Anyway, the thing I learned is that BTN can actually show a stat that I'm interested in. Now, if they could only answer my questions, maybe they'd be tolerable. "When the offense comes on the field they've got to put a drive together to... give that defense a breather that's been on the field a lot this afternoon." Yes Derek, I'm sure the defense needs a breather after playing 1 minute and 57 seconds coming out of a 20 minute halftime. Comment of the Week - Wife Edition: "You're not going to be in a good mood after this, are you?"